Attorney General Jeff Sessions’ Friday night announcement that he was firing 22-year FBI veteran Andrew McCabe may be plowing new ground in federal employment law, attorneys told Government Executive. McCabe, the controversial former acting FBI director who put in his retirement papers in January after meeting with Director Christopher Wray about his conduct handling probes related to the 2016 presidential election, became eligible to collect a pension as of Sunday, March 18. McCabe’s attorney, former Justice IG Michael Bromwich, declined comment to Government Executive other than to confirm that McCabe turned 50 on March 18, a requirement for eligibility to collect his FBI pension based on his years of experience. After he was caught in the ongoing partisan crossfire over the FBI’s handling of investigations of the Trump and Clinton 2016 campaigns, McCabe was accused by the Justice Department inspector general of misconduct—reportedly related to improper contacts with the news media and misleading FBI investigators. While the IG’s findings have not been made public, the FBI’s Office of Professional Responsibility—an ethics unit set up to be independent of the chain of command—recommended that McCabe be fired. 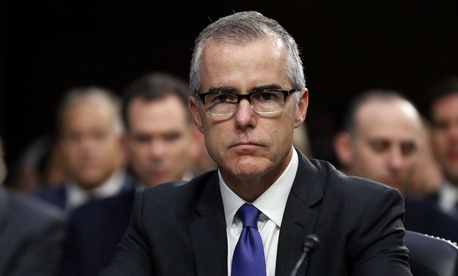 As an FBI law enforcement employee, Mahoney added, McCabe would not be entitled to an appeal to the Merit Systems Protection Board. If he could prove discrimination, he might have a case at the Equal Employment Opportunity Commission, the attorney said.